Goalkeeper Ernest Barry (left) with former Sliema Wanderers and Malta team-mate Carmel Busuttil. Ernest Barry comes from a famous footballing family. His grand-father, uncles and father were all noted players. His father, Fred, played for Floriana, Vittoriosa Stars and Hibernians. Barry was born on July 1, 1967. Tall and strong, he had the stature to become a top goalkeeper. Yet, his career was slow to take off because, many times, he had to compete with first-class goalkeepers. He started with Melita in 1981. In those days, the Amateurs had an experienced goalkeeper in Von Brockdorff and a very promising understudy in the late David Cluett who was then at the start of a long and successful career. In 1984-85, Von Brockdorff retired from football and Cluett took over as the first-team goalkeeper. Barry was promoted to no.2 but after four seasons with the Amateurs, he was still waiting to make his senior debut. Therefore, he decided to seek pastures new and in 1985 joined Naxxar Lions in the Third Division. It was a move that paid off immediately. In his first year, Barry won the third division league and cup double. In the next two seasons, he helped the Lions win the second and first division championships. It seemed that Barry’s career was now blossoming but after helping the club to reach the Premier League, he lost the no.1 jersey. Naxxar signed experienced keeper Alan Zammit from Sliema Wanderers and the young Barry was left to play second fiddle. That season, he only figured three times for the first team. So, it was no surprise that he left Naxxar to join Sliema. Barry stayed with the Wanderers for four years in which he, more or less, established himself as the club’s first-choice goalkeeper. 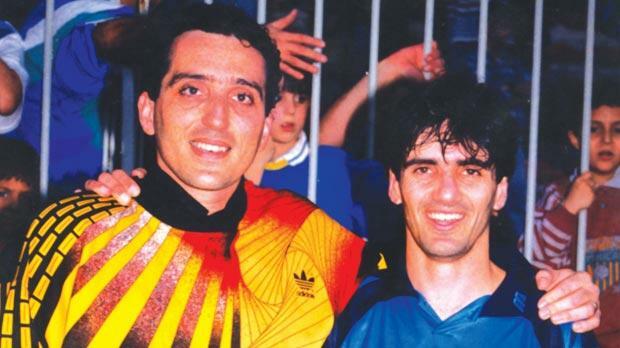 In 1993-94, however, he was on the move again, this time to Mellieħa in the first division and the next season with St George’s in the Premier League. Those two transfers did him a world of good. His growing reputation as a reliable, top-level goalkeeper won him the respect of everybody, including the national team selectors who gave him an extended run of 23 matches in the Malta colours. Rejoining the Wanderers, he stayed with the Blues for six eventful seasons. This was the best spell of his career, winning the league championship in 1995-96 and the FA Trophy in 1999-00 and 2000-01. Barry is only one of three Maltese goalkeepers to win the MFA Footballer of the Year award. It is unfortunate but also a known fact that upfield players are preferred to keepers when selec-ting candidates for this award. Those in goal must enjoy a truly outstanding season to have a chance of winning this coveted honour. Season 1999-2000 was a memorable one for Barry. His performances for club and country were of the highest standard. He not only led Sliema to victories in the FA Trophy, the Euro Cup and the Super Cup, but also turned in some exceptional performances for the national team. By now, he was 34 years old, an age when most players normally start to contemplate retiring. Barry, however, felt that he still had a lot to offer and when his contract with the Wanderers expired, he joined Valletta on a two-year contract. After his spell with the Citizens, he moved to Balzan Youths who had just been promoted to the Premier League. Barry was a role model for anyone aspiring to make the grade in football. Throughout his career, he always had to compete with other first-class goalkeepers both at club and international level but never gave up. Sometimes, luck was not on his side but this only served to make him more determined.